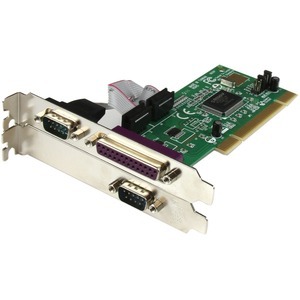 Suitable for installation in a small form factor computer, the PCI serial/parallel card includes an optional low profile/half-height mounting bracket that makes installation easy. The serial/parallel combo card is PCI plug and play ready and supports IRQ sharing for fast, simple installation. The combo card is supported in virtually any Microsoft Windows operating environment (Windows 7, Server 2008 R2, Vista, XP, ME, 2000, 98, 95 and NT4), and is backed by a StarTech.com Lifetime Warranty and free lifetime technical support.